After years of searching and some failed attempts at dating, you have found the one and on your way to making it official. Getting married is a huge milestone in most individuals lives and planning a wedding can be stressful but should always be considered a joyous event. Every moment counts as you count down the days to your wedding nuptials. You’ll want to remember every detail and emphasis even the smallest element to create long lasting memories. 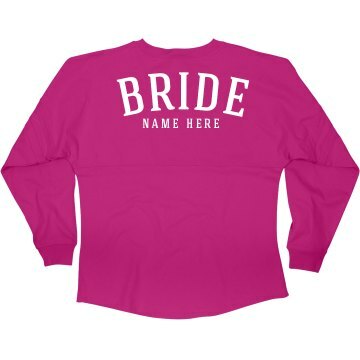 Bridal Party Tees wants to help you create lifelong memories by sharing a list of the best bride shirts! 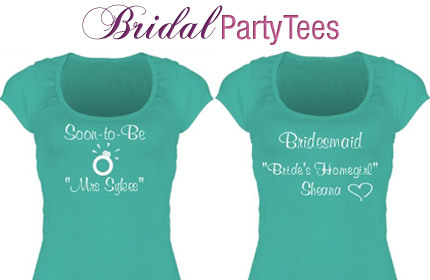 Designing a custom bride shirt is a fun and an exciting way to, in lack of better terms, get the party started! 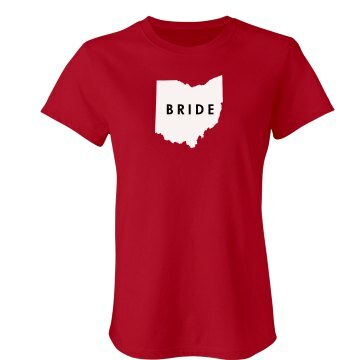 Create a bride shirt to wear during the planning process, on your big day, or while you are are vacationing on your honeymoon. We offer a large gallery of designs to choose from but you can easily take any design and swap it onto any product. 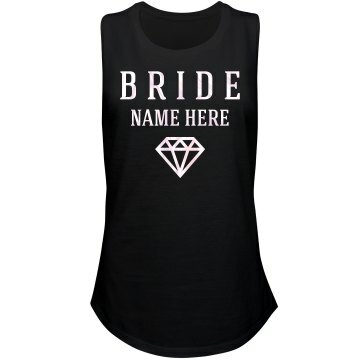 Our custom bridal apparel includes jerseys, sweaters, tank tops, crop tops, undies, and more and our design processes include glitter, rhinestones, and our newest addition: metallic foil! 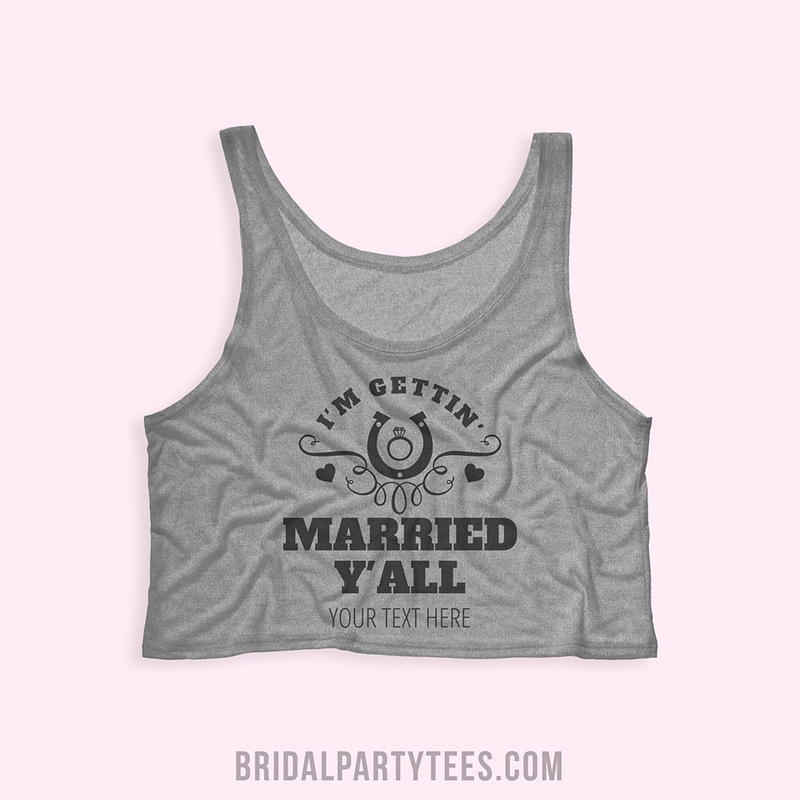 Bridal Party Tees has the trendiest and most stylish selection of tees, tanks, and hoodies online. 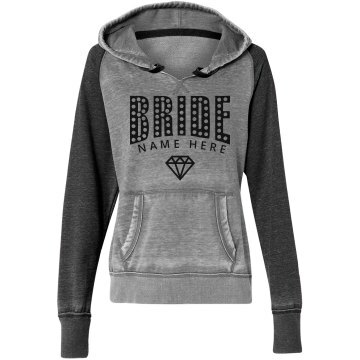 We carry the top brands in custom apparel that include: Hanes, American Apparel, Bella, Gildan, Alternative Apparel, Canvas, and Jerzees. We also use direct-to-garment digital printing for the majority of our products, which gives our designs vibrant and long lasting prints. 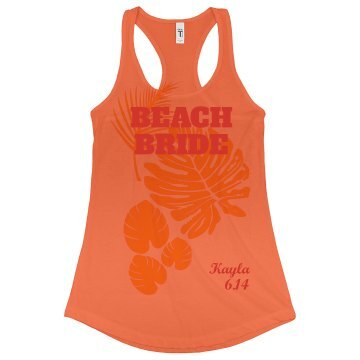 We pride ourselves on being good at what we do and offering you the best services in custom apparel. Learn more about our art and printing process but we promise you won’t be disappointed. 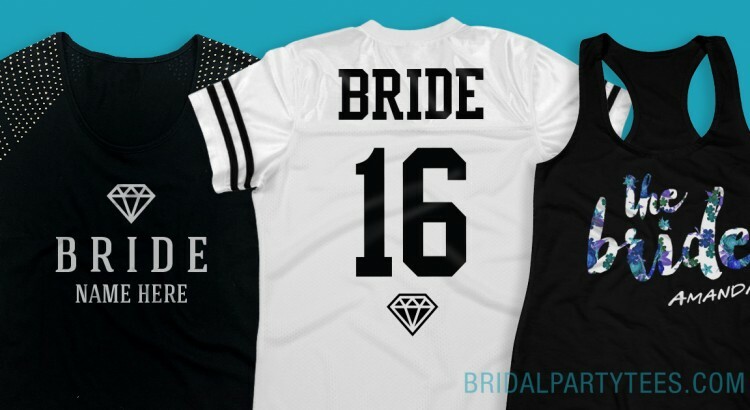 There’s nothing we love more than offering our customers the best and trendiest bridal apparel online. 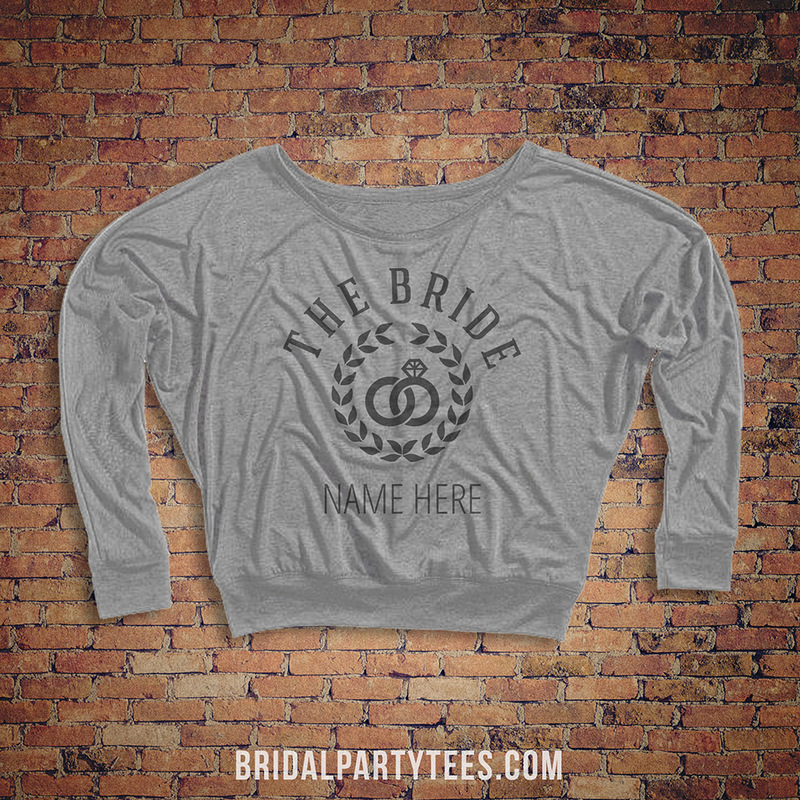 Share your pictures with us on Facebook, Twitter, or Instagram @bridalpartytees! Braids! Braids for the bride, bridesmaids, maid of honor, and your flower girl will add an old-world touch of class to your ceremony. Not to mention, they make for a super easy updo, keep flyaways at bay, and look great on just about everyone. Green and orange. Straying from the norm of pastels, pinks, and purples, planning an Irish themed wedding will ask of you to incorporate some orange and most definitely green into your flowers, centerpieces, and accents. The Claddagh ring. Perhaps, your Irish roots are a little distant and you don’t necessarily want the Claddagh to be your ring. However, the heart-in-hand symbol represents love, loyalty, and friendship. 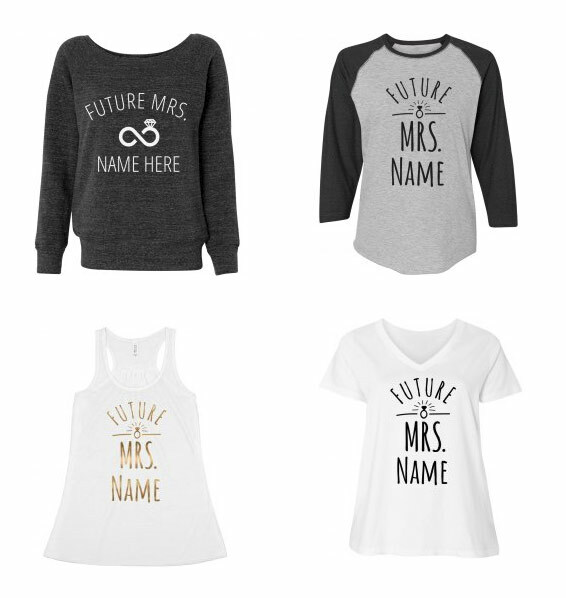 HELLO, can you say perfect bridesmaids gifts?! Tying the Knot. Ironically, the phrase “tying the knot” is rooted in an Irish wedding tradition. Once the bride and groom have signified their pledge to each other, a rope or ribbon is tied around their clasped hands to symbolize their commitment to one another. Irish dancing. Maybe you don’t want to go overboard and hire Riverdance to perform at your wedding, but a few Irish step dancers or Irish step dancing lessons at the beginning of your reception is a good way to break the ice and get the party started. We’re willing to bet that any of your guests can be turned into Irish dancers after a few pints of Guiness anyway! Kilts. Again, we totally get it if your groom (or you don’t want your groom) dressed in a traditional kilt for the big day, but try incorporating plaid vests or cummberbunds into the groom’s party. 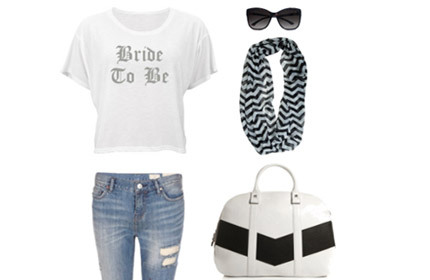 Think how cute would the ring bearer would look! Wedding Bells. Another Irish wedding tradition is incorporating bells into the ceremony. Some say the tradition is to give a small bell to every wedding guest to ring to ward off any evil spirits and protect the bride and groom. Others believe that it is Celtic tradition to gift the bride and groom a bell on their wedding day as a reminder of their devotion to each other. Whenever an argument is brewing, one of them rings the bell and declares a truce of sorts. Irish lace. Chances are you’re already considering lace in your wedding dress or veil. If you haven’t made the decision yet, go for lace! Lace is a part of Irish wedding traditions and will add a soft, feminine touch to your look for the day. 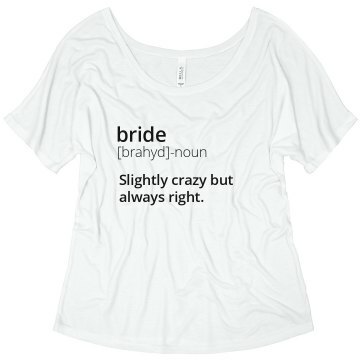 Your Custom Irish Bride shirt! 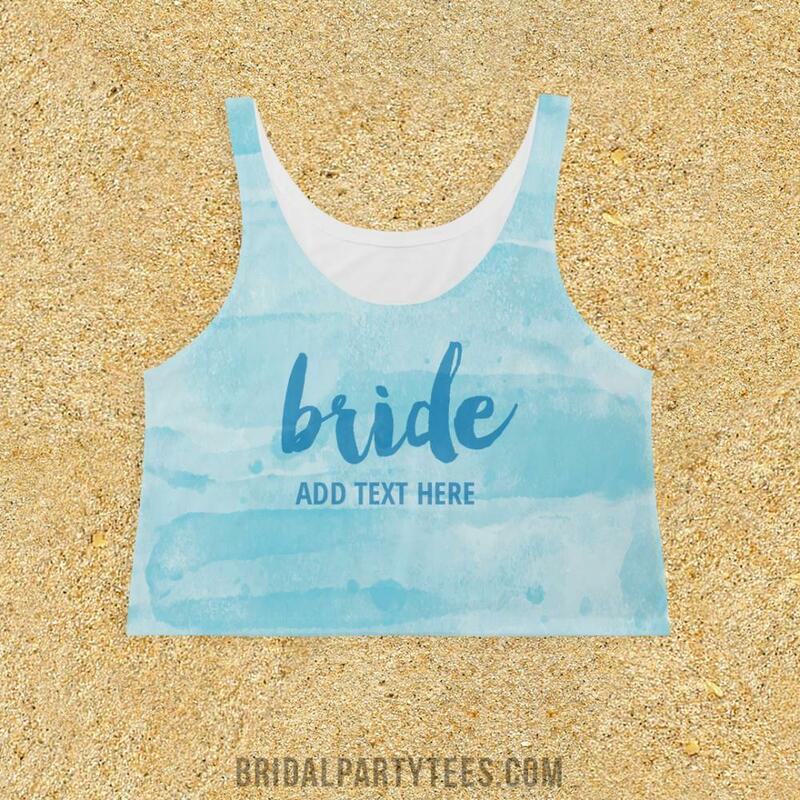 For when you’re running around making all of these plans, for your honeymoon, or for your bachelorette party, customize an Irish Bride shirt! Luck. Everyone wishes the bride and groom luck on their matrimonious day. But if you do it right, horseshoes and shamrocks can add a touch of the Irish flare that you’re looking for! Try putting a few four leaf clovers in your bouquet or your bridesmaids’ bouquets. They can be pulled off in a flower hair crown too. Horseshoes are perfect necklace, bracelet, or garter charms. Or print the symbol on your invitations, programs, and party favor bags! You never know if these little touches will bring you extra tidings of good luck! Ireland! And finally, after your Irish wedding is over and the guests have gone home, pack your bags for a honeymoon in Ireland. 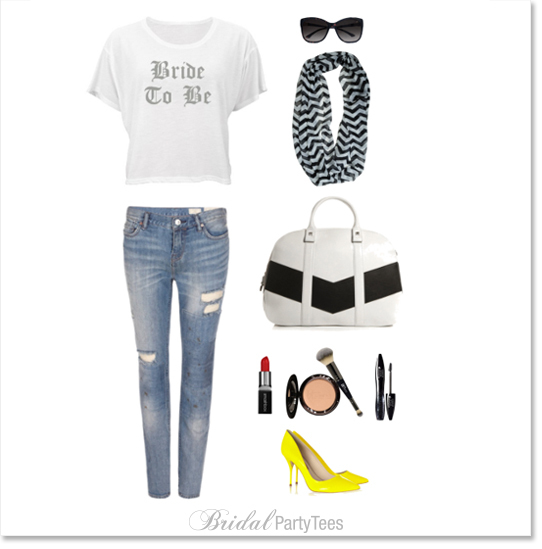 However you theme your wedding just bring lots of love and we’re sure you’ll find all the luck you need. Find more Irish wedding inspiration here! 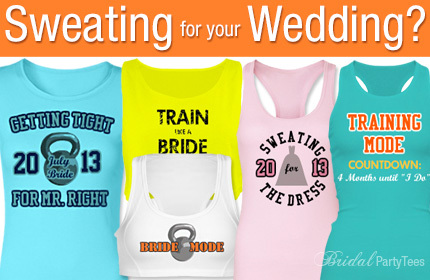 Sweat for Your Wedding in Custom Tees and Tanks! 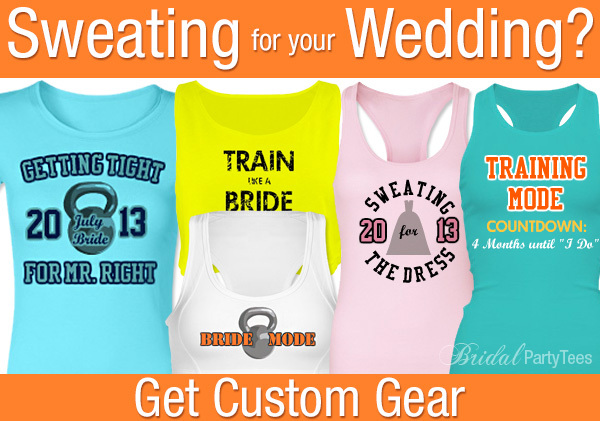 If you’re like most brides, you’re probably trying to get in shape for your wedding. 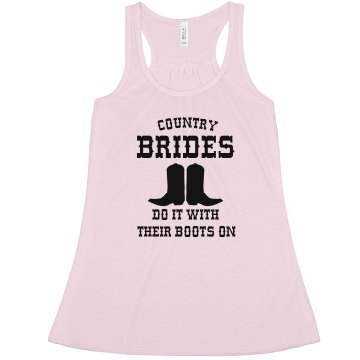 After all, you want to look good in that dress! 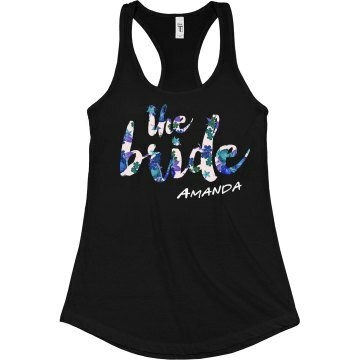 We’ve got the perfect bridal workout tees to keep you motivated! 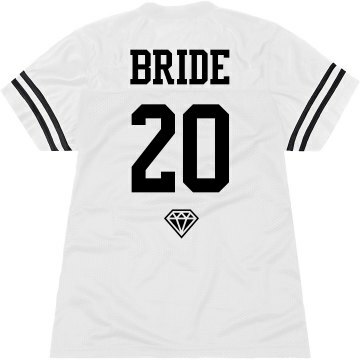 Customize a tee that says Sweating for the Dress, Getting Tight for Mr. Right or several other clever sayings. 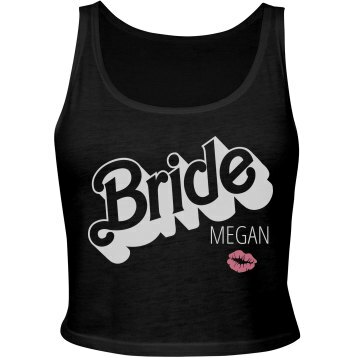 We have lots of cute performance wear to put your design on, which is perfect to wear while sweating for your wedding!